If you want your eyes to be the main attraction on your face, then you need to learn how to make them pop. There are some women who absolutely love their eyes but they simply just don’t stand out enough. If you are one of those women or you just want to experiment with different eye makeup, there are a few things you can do. There are several makeup tricks that that help make your eyes pop and look much larger and most of them don’t take that much extra effort than what your normal makeup routine may be. If you are going full makeup for a night on the town, then use a small amount of light or even white eyeshadow right in the corner of your eyes to make them look much larger. Apply the eyeshadow right next to your eye duct (right in between the ridge of your nose). Blend the color in slightly but make it so that the shadow is not completely blended in so you can’t see it anymore. This is an old trick that lots of makeup artists use on celebrities and professional clients to help make their eyes look bigger. You can also do this makeup trick with a white eyeliner pencil and simply line the lash line in the corner of the eyes. If you want your eyes to pop you need to curl your eyelashes. Some women are scared to do so, but there really is nothing to worry about. Buy a quality eyelash curler and just be sure to keep it clean so it doesn’t pull on your eyelashes. 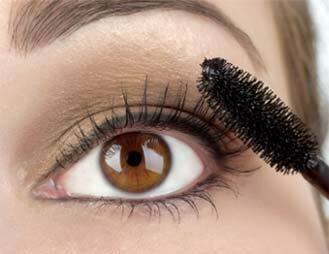 Curling your eyelashes upwards helps to open up the eye more. The longer lashes you have, the more your whole eye will pop and appear larger and brighter. If you want your eyes to pop you need to use mascara on your lashes to make them appear darker and longer. The key though, is to not make them look clumpy or lumpy. Instead they should have a long clean line that goes straight upwards. To help you achieve this look run the mascara brush upwards though your lashes and use a piece of small paper behind them to help guide them. The paper prevents your lashes from bending from the mascara brush and instead gives them that straight, clean line look. A good way to elongate your eye is with a winged tip eyeliner technique. This simply means you start your eyeliner halfway from the corner of your eye and draw it towards the outer side of your top eyelid. Then when you reach the outside corner of your eye, you simply take the eyeliner upwards and out a little further, which helps to draw the eye open more. Don’t start your eyeliner right in the inner corner because that closes it off and even with a winged eyeliner your eye will actually look smaller. If you really want to make your eyes pop, you may have to use darker colors than you may be used to, so that you really get the attention on your eyes. This could mean something like a smoky eye with smudged black or dark grey eyeliner or simply an eyeshadow that is a shade or two darker than what you normally wear. Just be sure to apply the color properly and not close off your eye but it should blend right in to make a continuation. Here’s a little bonus tip that doesn’t have to do with makeup but can really help draw attention to your eyes. Be sure that your eyebrows are shaped and maintained. If you eyebrows aren’t maintained and they are too wide or you have misshaped brows it can affect the way your eyes look. If your brows are too thick or not shaped, they can close off your eyes and make them appear smaller. If you are scared of doing your own eyebrows, make an appointment with a local salon to get them waxed or threaded and this way you have a professional doing it. You can have all the attention on your eyes and really make them pop by simply following these basic tips next time you put on your makeup.